I got to know Jill Weber about five years ago when we started our second Teaching American History grant at ESSDACK. And she’s been great about opening up her classroom in a variety of ways including posting ideas and strategies on her blog A View of the Web. Jill recently shared a post with our study group that she is allowing us to cross-post. Enjoy! My 7th graders will be taking their first test for me this week. I thought this would be a good time to talk about what a Social Studies test in Mrs. Weber’s class looks like. Social Studies has changed. Teachers should be implementing activities, lessons, and strategies to help students read and analyze primary sources, think critically, and “do” history. We should be teaching kids how to become historians. How to question sources, look at conflicting view points, and draw conclusions based on the evidence that is given to us. And what does it look like on a TEST? I have spent the last three years developing a method for creating unit tests/assessments that involve more analysis and application as opposed to simple regurgitation of facts. Here’s a taste of what you will and won’t see on one of my tests. Won’t: Multiple Choice. Those tests were so much easier to grade. Just simple regurgitation of what we spent the last few weeks learning. However, multiple choice tests only tell me if you are good at memorizing information or have a good “guessing game” strategy. Will: Multiple Mark. Here is an example of a couple of my multiple mark questions which uses a map and primary source document as a guide to the question and answers. Won’t: Vocabulary Matching. Boring. Plus, I don’t care if you can memorize a definition. I care whether or not you UNDERSTAND how the word is used in the CONTEXT of what we are studying. Will: Applying the knowledge of vocabulary words in context. 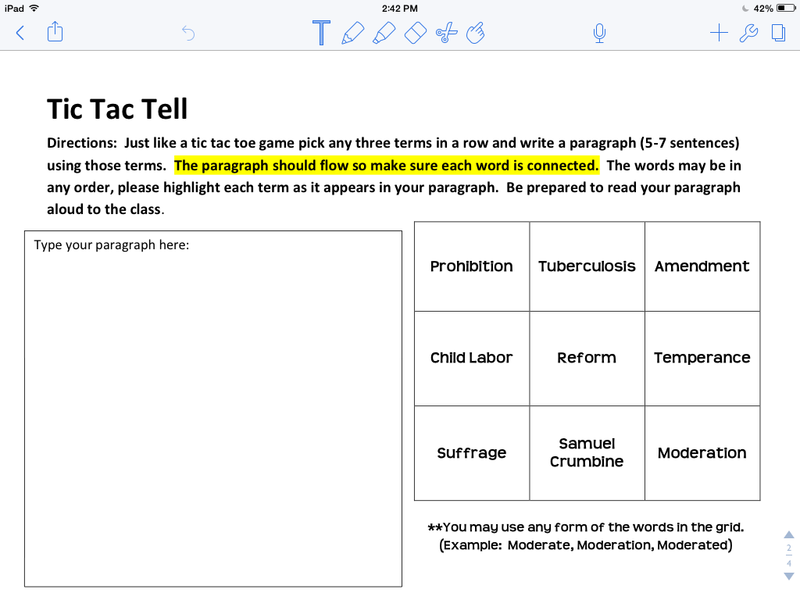 I love using strategies such as Tic, Tac, Tell, and incorporating the vocabulary into questions. Won’t: Have one word answers. 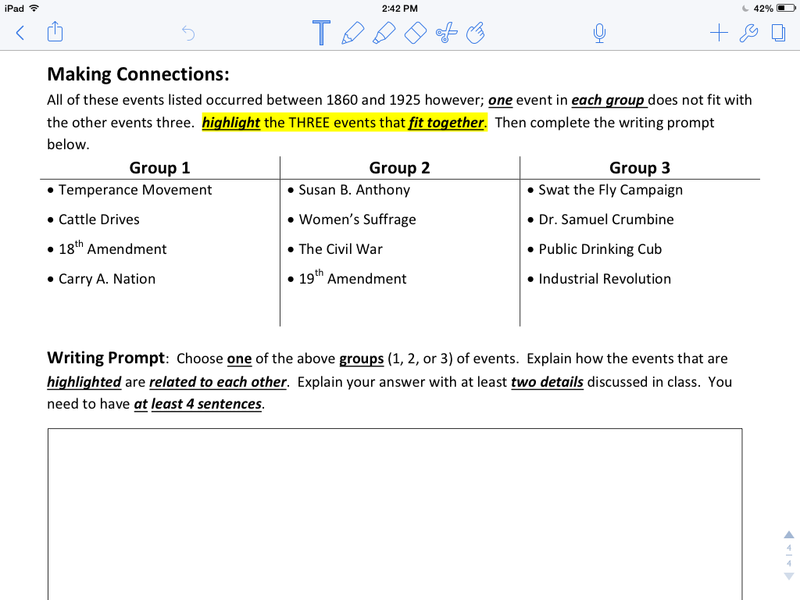 Will: Have to explain why, make connections to events and/or people, site evidence from text given, or list details discussed in class. Won’t: Just consist of 3-4 pages stapled together. Will: Have to reference documents we discussed in class, use images (paintings, pictures, maps) to complete questions, and fill in charts, graphs or graphic organizers. Not everything needed for a test can be put on the actual test itself. Students will be using iPads for color images (so I don’t have to print off 70 copies of a color test) and handouts of primary source documents. Won’t: Find “Google-able” questions. I often get questions from teachers and parents if this type of test (using technology to view photos, maps, and documents) can encourage or facilitate cheating by having access to the internet. Guess what…these kids live in a day where they can (and will) access the internet in an instant at their fingertips. Good for them. The questions I ask require kids to draw conclusions from documents provided, make connections to terms and events we have discussed in class, and think critically. Was the Declaration of Independence written for ideological reasons, such as liberty and freedom, or selfish reasons by those who had money and power? Support your answer with evidence from the sources provided. When looking at John Gast’s painting of “American Progress,” how do you think he wanted you to feel looking at the image? Why do you think this? Using the primary sources provided, explain why those who practiced temperance wanted a prohibition amendment. What method did they use? Do you believe it was successful? Why? And yes, those are current questions on my 7th and 8th grade tests. And yes. They can answer these type of questions successfully. Because we practice it in class. Consistently. Nothing that shows up on these tests, whether it’s topic or method required, is brand new to the students. We do this sort of thing daily. The kids are used to it. If you try to implement this type of test without practicing the same thing in class on a regular basis, you will have frustrated kids with frustrating scores! 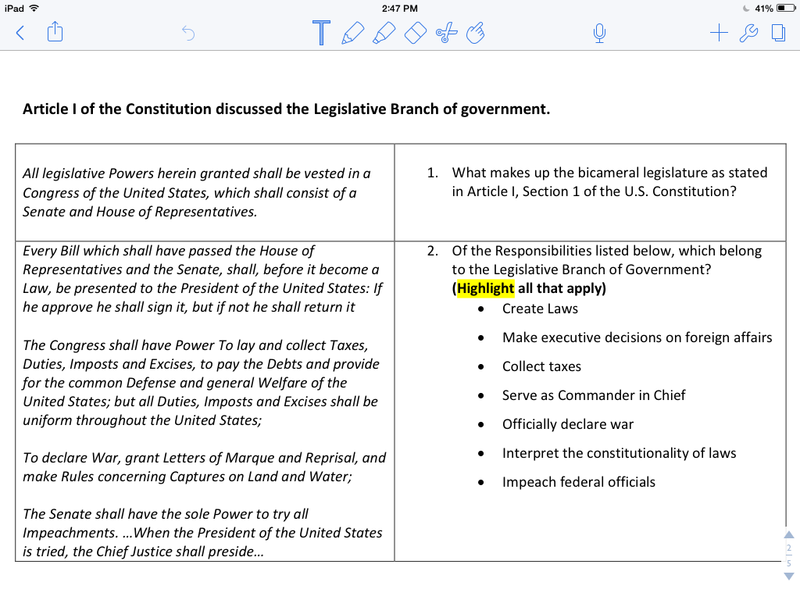 Will: See questions, documents, maps, and processes done in class. I do not create tests in order to make kids feel like I am trying to trick them. Almost everything that shows up on a test has been looked at, discussed, or practiced during our normal class periods. Won’t: See test score by the end of the class period. I used to be able to do that. Get a traditional test graded, entered in the grade book and passed back out to the students during the same class period they took the test. Wow. Seems crazy now. This “new and improved” method for testing does mean that I have to spend a little more time with each student’s response. Grading takes longer. Will: See a true result on how well students know the material. It is easy to learn how to cram for a multiple choice test, guess at the write letter and end up with an A or B. Not now. This gives me a true look into what my students’ strengths and weaknesses are. The answers are not always “yes” or “no,” “A” or “B.” If a student can explain their answer, and site evidence to support their reasoning. That tells me so much more than a guessed letter. There you have it. At least a taste of it. What to expect on a test that requires kids to do more than just spit back the facts they could have googled in ten seconds. Whether your a teacher looking for ideas, a parent trying to understand what is expected of your teen, or a student trying to get a leg-up on the next exam, if you have questions . . . ask! I will help in any way I can. I’m a first year teacher and I am curious if doing this type of testing can be done on Google Chromebooks. Do you have any suggestions on how I could do that? I haven’t played around with Google Forms yet, but it seems like it could be useful. The cool thing about Chromebooks is that they are designed specifically to run Google tools like Forms. Try this site for some ideas about Google Forms and all sorts of other google tools.